Is it safe to swim with wild dolphins? The reports of people being injured by dolphins are almost exclusively from interacting with dolphins in captivity. Wild dolphins are free to move as they wish, and if they don’t want to be with us, they simply swim away. 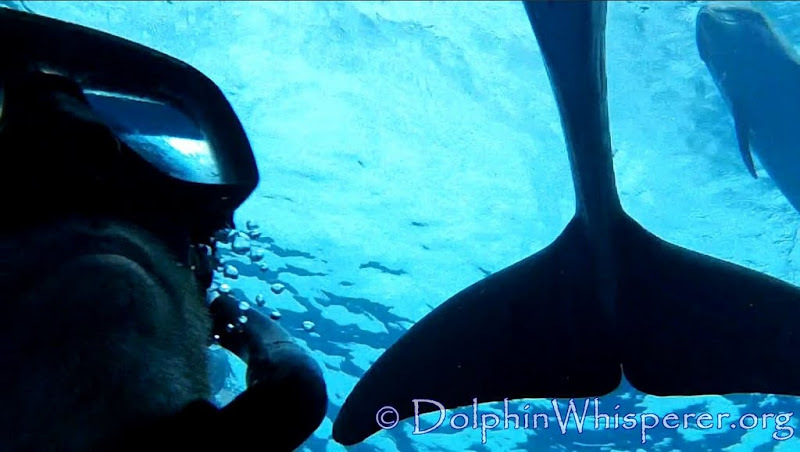 The reason we swim with these dolphins is that they consistently, playfully and lovingly seek out interaction with us. What about us Non-Swimmers? Can we get in the water with the dolphins? Absolutely. We’ve had many non-swimmers on our trips. We outfit you with life preservers and all the floatation you need, so that you feel safe and comfortable in the water. We’ve had many people come as non-swimmers and leave as swimmers. What about sharks? Sharks are not the vicious predator that TV has made them out to be. I know, I swim with them a lot separate from our dolphin trips. (And yes, we can include a swim with the sharks if you want on your custom trip). Sharks are the dolphins main predators, and so the dolphins are very aware of any shark that might be in their surroundings. Because of this, and the fact that we swim with the dolphins in crystal clear waters that average 30 feet deep, it is a very safe encounter. Nurse sharks: The bottlenose dolphins sometimes have nurse sharks that follow them to feed off their scraps. Nurse sharks are like sucker fish; they have no teeth, are bottom feeders and non aggressive. We are monitoring your safety at all times. How safe is Bimini? Bimini is a small island, the people are friendly and everyone knows everybody else. It is a very safe place to bring your family and friends. My own son has been coming here since he was a toddler. Do I have to be in shape to come? We have people of all ages and abilities on our trips. I’ve personally brought babies and people with disabilities into the water with the dolphins. It is our desire to include everyone, and, there are some limitations on who we can get into the water. Please call and let’s talk. Should I wait until my kids are older? I’ve brought pregnant mothers, people in their eighties and 6 month old babies into the water with the dolphins. We’re never too old or too young to meet them. As soon as I had my own life-changing encounter with the dolphins, I brought my son Mark and his mom to swim with them. He was 3 years old and he still remembers. If I’d known about the dolphins earlier, I would have arranged for him to meet them when he was still in his mom’s belly. What is the weather like? The weather is similar to Miami. In the winter, daytime temperatures average 76F/ 24C and ocean temperatures average 75F/24C. In summer, the daytime temperature can get into the 90’s F/ 32C and the water temperature is in the mid 80’s F/30C. How do I make my flight arrangements? There are a number of ways to fly into Bimini, and the choices can be overwhelming. I am happy to help you with your flight arrangements. There’s more information on the Trip Info pages. Please feel free to call or email me if you still have questions, I look forward to talking with you!